1. In a large bowl, whisk together flour, baking soda and salt. 2. Add Greek yogurt and blend until lump dough forms. 3. Divide dough into 8 equal parts. 4. Grab the first chunk of dough and roll it around using your hands, pressing it together to compact it. Then poke a hole in the center and gently squeeze the dough all the way around to enlarge the circle. The hole in the center should be about 2" wide. 5. Place the bagel-shaped dough onto a lined lightly floured baking pan. Repeat until all bagels are formed and placed onto the baking sheet, leaving space between each so they have room to expand. I put four bagels on each baking sheet. 6. 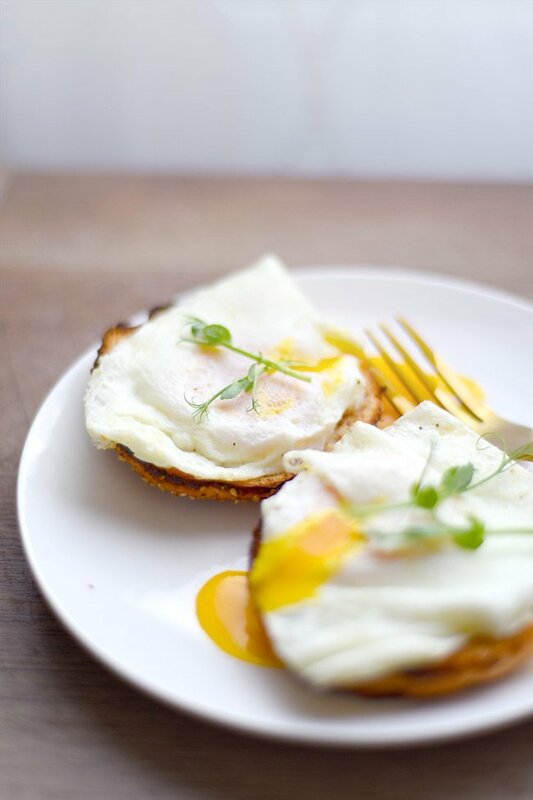 In a small bowl or cup, beat the egg then brush it onto each bagel. Add your toppings. 7. Bake on the upper rack at 400˚ for 20-22 minutes or until lightly golden brown. Remove from oven and cool for about 5 minutes before cutting. 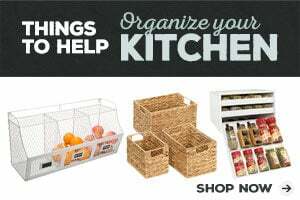 Topping ideas: Everything bagel topping, dried onions, poppyseeds, sesame seed, salt, etc.! 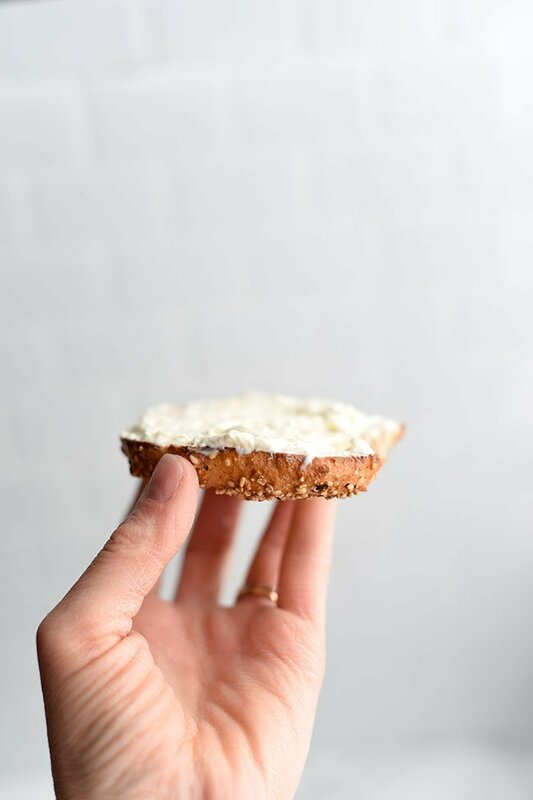 Looking to cut carbs without giving up your beloved bagels? 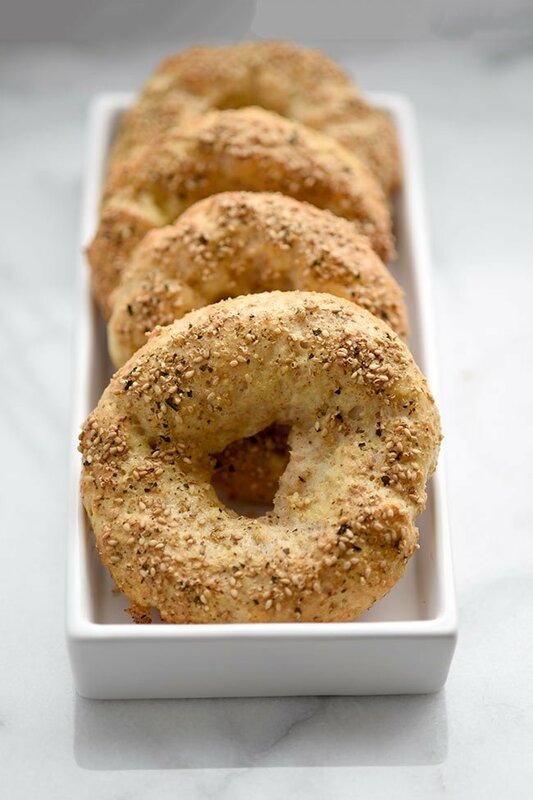 These homemade low carb baked bagels will be your new best friend. Homemade bagels, really? That’s possible? Yep. Never in my life would I have thought I’d find myself making my own bagels. I don’t know why the thought really never crossed my mind. Homemade bread? Sure. But bagels? That’s a whole other level I thought was out of my reach. The boiling I think is what scared me. It sounded complicated and I like things that are easy. 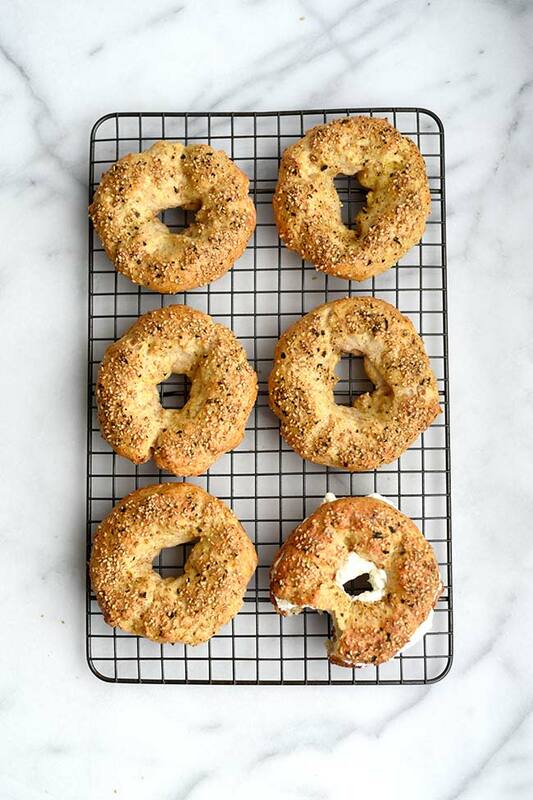 These bagels are baked, no boiling required. Come to find out you don’t need to boil bagels. You can learn more about why the pros boil bagels, but essentially it creates a thicker more chewy crust. And to be honest, I always toast my bagels anyway to get rid of the chewy crust. So my lazy brain says, why boil them then? You don’t need to. In fact you’ll get a lighter, less dense bagel if you don’t boil them and I actually prefer that as well. Dense bread makes me feel like I’m instantly gaining 5lbs with every bite so the lighter, the better in my opinion. The second part about homemade bagel-making that was a little scary was the lye. It’s so dangerous you need gloves and goggles to use it! That sounds kind of fun actually but not really something I want to get into if I’m making bagels on the reg. So I did a little research to find out if you need to use lye when making bagels. 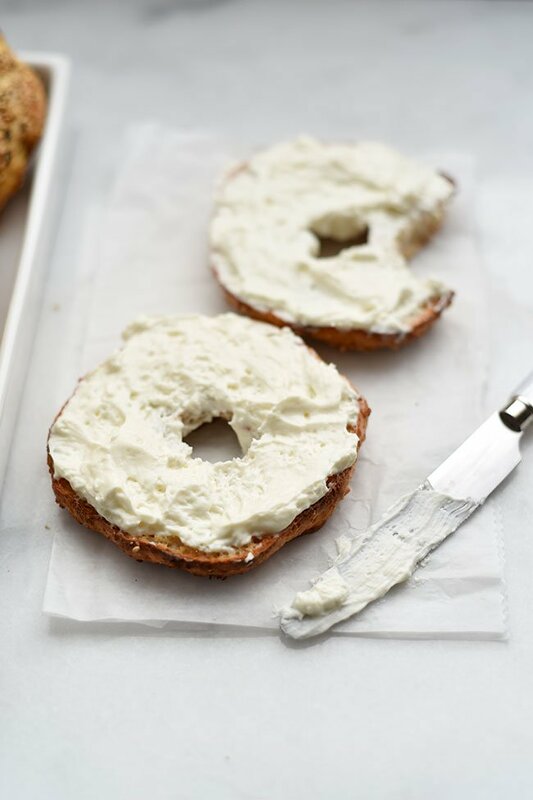 Here’s what I found out: Lye is what gives the bagel its brown color and unique flavor. Hmmm… sounds kind of important. But as I read more I discovered you can achieve those qualities in other ways. Baking soda, in fact, is supposed to have a very similar flavor as lye once baked. “Great,” I thought! You’re going to need that to get the bagels to rise anyway. Two birds with one stone. I like it. And for the brown color. If color is really that important to you, then you can get that with an egg wash. The egg wash also serves to help your toppings stick so again, two birds with one stone. See, lazy cooking is all about efficiencies and making legit excuses for leaving out extra steps and ingredients. 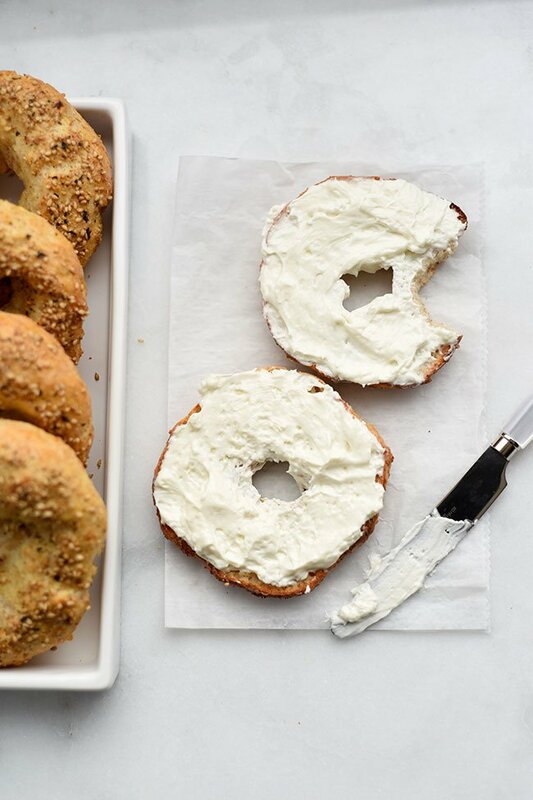 So, yes, you can make delicious bagels without lye and it’ll be just fine. Finally, I thought there was yeast involved. And some bagel recipes do call for yeast. Me no likey yeast though. The fact that yeast is a living thing and that it may or may not activate is a risk I’m not very willing to take. It doesn’t jive with my lazy ways of finding things in the cabinet about to expire and using them anyway. ???? Guess what though? Things rise without yeast. You just need to employ the magical powers of baking powder yet again. Magical yet humble. It just sits there, patiently, on the top shelf of the cabinet, not taking up much room then comes to rescue when you need flavor and air bubbles. Love it. Easy to make on the first try. So. How did I end up getting into all this bagel-making research? 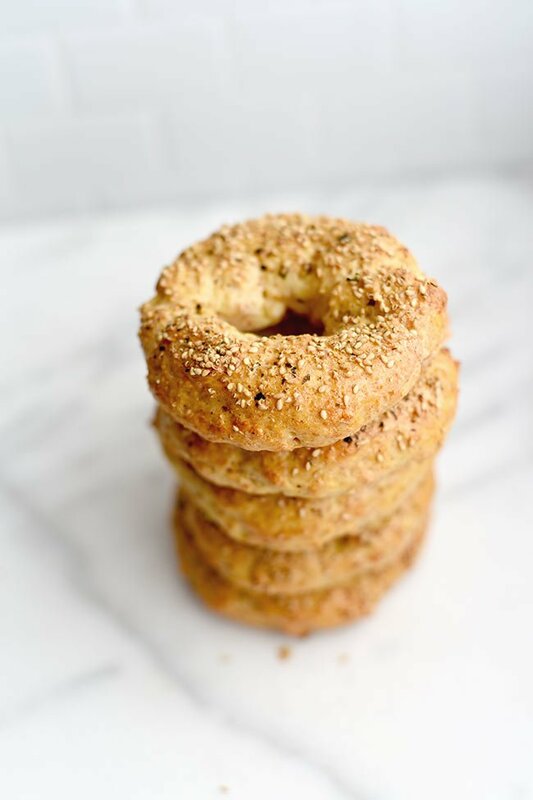 Well, I stumbled upon a recipe posted by Skinny Taste for 5-ingredient bagels. No yeast. No boiling. No lye. I liked the sound of that. I read her tips, (You can read them too here) and was able to make delicious homemade bagels on the first try! So, I’m confident you can too. My ingredients are the same as her recipe but method slightly different (lazier). There’s truly only five ingredients (plus toppings) and you can even reduce the ingredients down to TWO if you use self-rising flour. But that requires you to actually have self-rising flour and I typically only have regular flour. So, five it is. 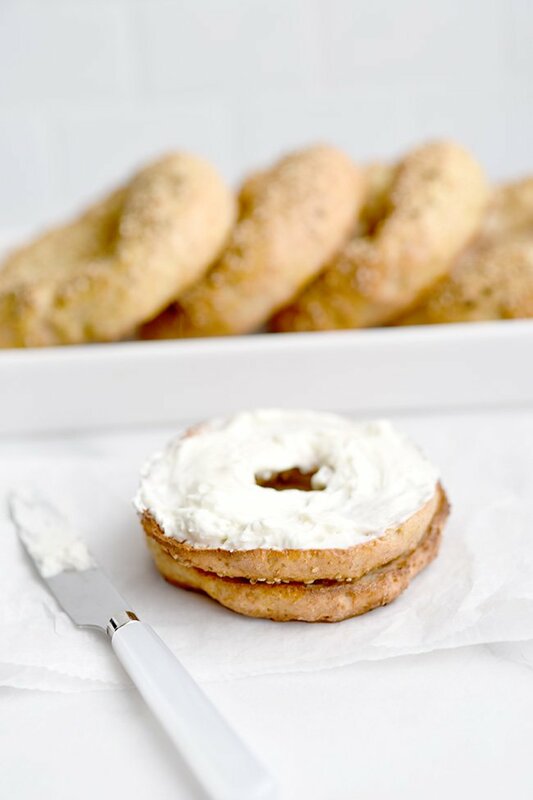 When you use almond flour, these bagels are gluten-free flour! 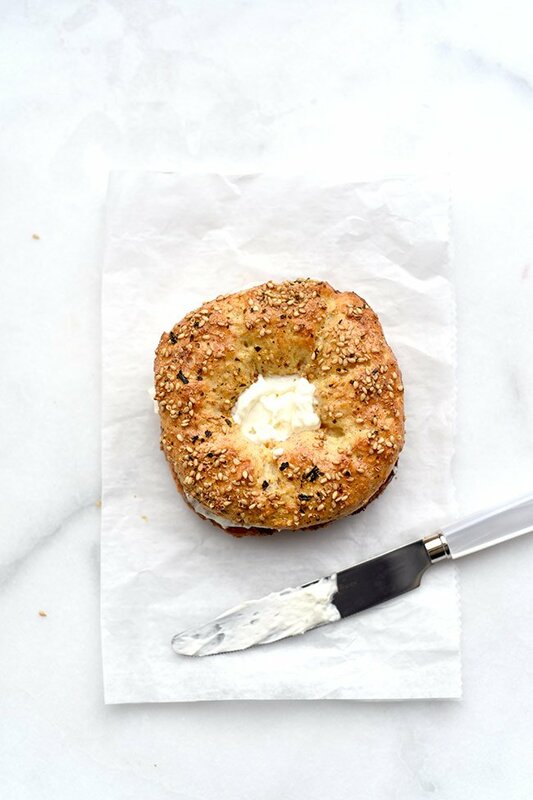 Make it an Everything Bagel! You can find Trader Joe’s Everything but the Bagel topping on Amazon or obviously, at Trader Joe’s if you’re lucky enough to live close to one. Yes, you absolutely can however, you will add a significant amount of carbs. You really don’t need anything special to make these other than a little blond confidence and trust. It does help if you have silicon baking sheets or parchment paper though. 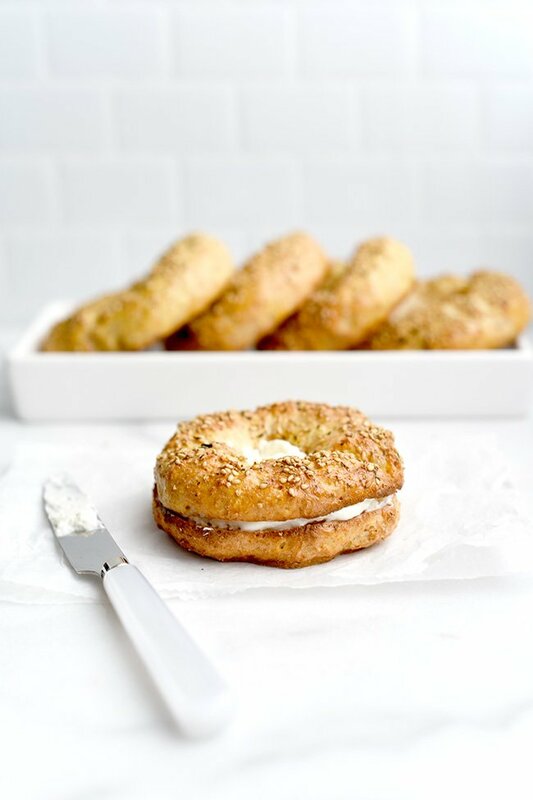 These low carb baked bagels were featured on Make Life Pretty and Wow Me Wednesday!